Finding conference spaces, meeting rooms, team-building venues & more! No meeting is held without a purpose. You may be looking to set the right impression for your clients by showcasing your brand’s quality proposition, to win your next contract, celebrate in grand style, or simply refuel your mind with like-minded companions. Nothing but the best of meeting venues will do. And because you deserve it, look to meeting rooms in London for an inspiring venue to deliver the perfect backdrop to your event. 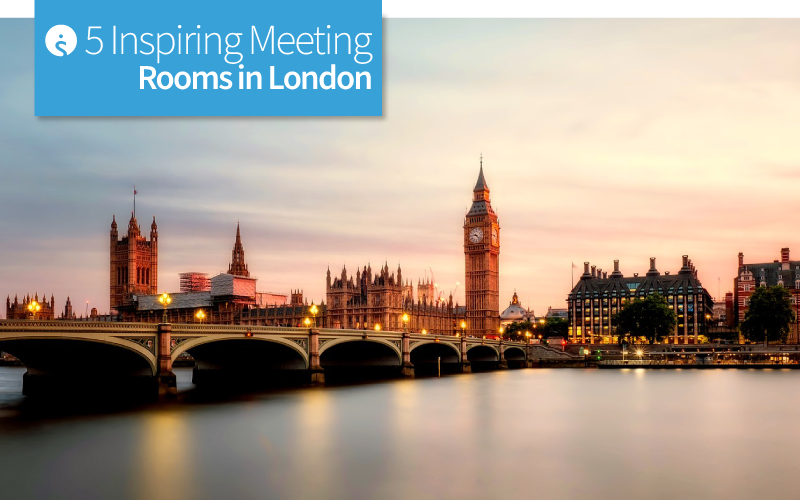 London, as you would expect, has some of the most sought-after hotels with awe inspiring meeting rooms. Consider one of the five hotels listed below for your next meeting or celebration. You will become the talk of your business sectors circle for the luxury and hospitality you treat them to. In Aldwych, Covent Garden, London, stands this landmark hotel showcasing millions of pounds worth of extravagance certain to make you and your guests feel like royalty. 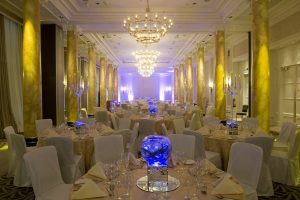 Host parties, gatherings or business meetings with aplomb and entertain with generous hospitality, right here at Waldorf Hilton, where a touch of class and panache guarantee a memorable time. 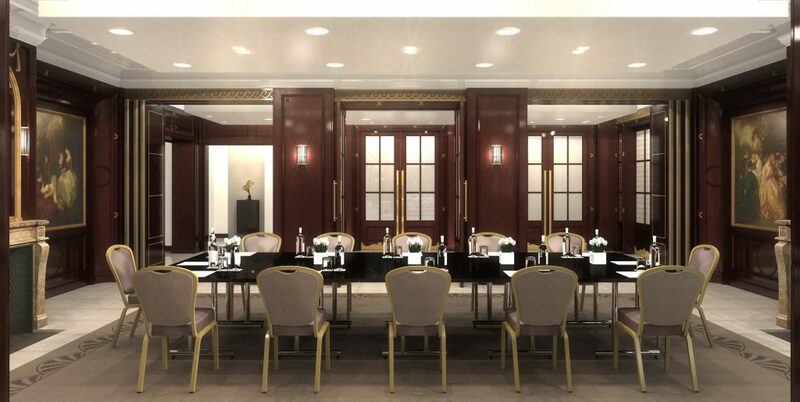 The hotel offers seven boardrooms, ranging from the classical Aldwych and Westminster rooms to the elegant Boardroom, all of which make for an inspiring choice of meeting rooms in London. The Executive Boardroom is decorated with classic oak panels and was once a historic Gentleman’s Cigar Room with original fireplaces and antique paintings. This is one elegant room to entertain your respected crowd. A great room to make that first impression and shake hands on a deal. The conference rooms are fully equipped and include full blackout provision for slideshows, wireless high-speed internet, high traffic air-conditioning accompanied with periodic refreshment breaks. There are more conference rooms which are ideal for exhibitions and trade fairs. The Adelphi Suite is large enough to host an exhibition with up to 400 delegates. It is fully equipped with lighting facilities and internet access. The hotel offers flexible options of clubbing conference rooms to create larger spaces to accommodate up to 700 delegates. The event management team is very experienced and well trained to handle any demands on the fly. The catering team plans a well-balanced menu with a good blend of dishes to cater to a global crowd. Surprise your guests or delegates with decadent champagne and an afternoon tea served at the Grand Salon or in a private room of your choice. This iconic hotel is located in King William Walk, Greenwich, London, and is the perfect place to take your next business meetings, banquets and award ceremonies to, especially if you and your guests are ardent fans of history, heritage and culture. This inspiring UNESCO certified world heritage site building is a conglomeration of grand history and modern amenities. This red-bricked Georgian building with its tall white columns, bold lines and structural symmetry gives you a feeling of being swamped by living-history. A superb backdrop for a meeting in London. The De Vere Devonport House offers over a dozen meeting halls with seven interesting combinations to choose from. The grand Westminster can seat anywhere from 42 delegates in a boardroom setting to 120 guests in a theatre style seating. If you require a more private setting for your attendees, the elegantly decorated Hamilton can offer a boardroom seating arrangement for 25. The exquisite Arch Royal is another superb space for your small meetings. The boardroom at the Arch Royal can seat up to 12 prime delegates. If you are looking for an informal huddle, the U Shape option would be a great choice for seating up to 26 delegates in the impressive Drake. This hotel brings together a wealth of original Georgian features along with impressive modern amenities like super-fast WIFI with bandwidth of 100 megabits throughout the premises to deliver an ideal setting for meetings, events, teleconferencing and training sessions. This unique venue consists of sprawling gardens where guests can walk and unwind, inhaling and imbibing history into modern life. 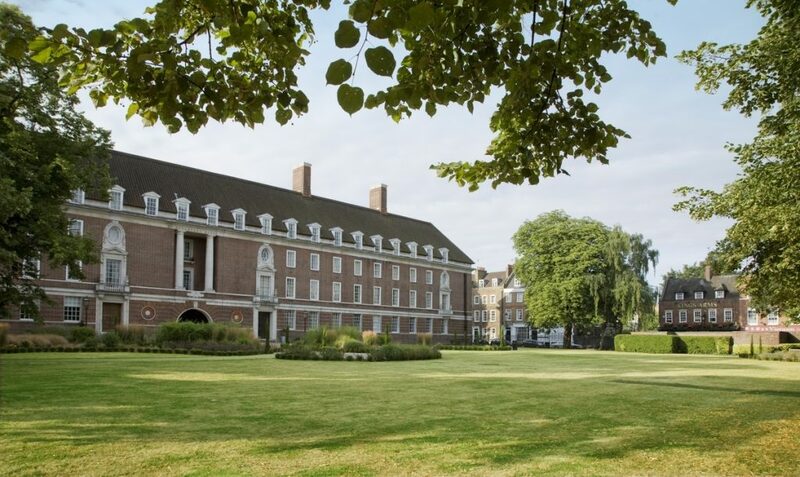 De Vere Devonport House is also strategically located at a convenient walking distance to the Cutty Sark and two railway stations for easy hops to the city. The venue management understands your requirements and can help with everything, right from setting up a unique décor for your meeting, to planning a lavish menu suitably impressive for an inspiring London venue. 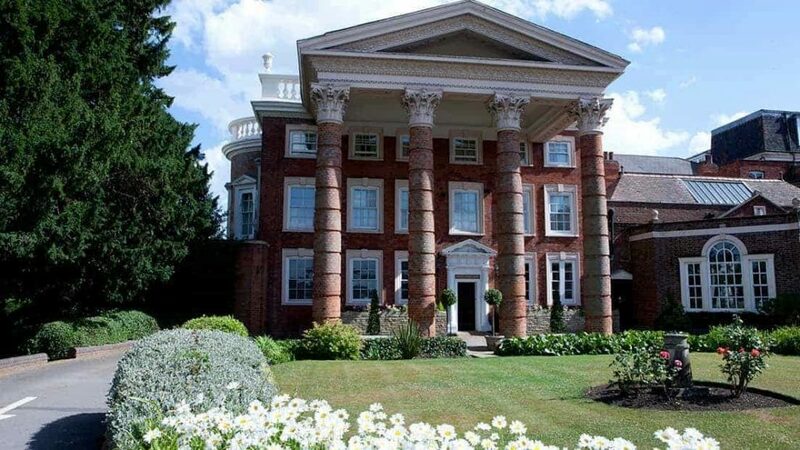 This splendid hotel, situated in Ashley Lane, Hendon, London, offers all the charms of an urban country house. 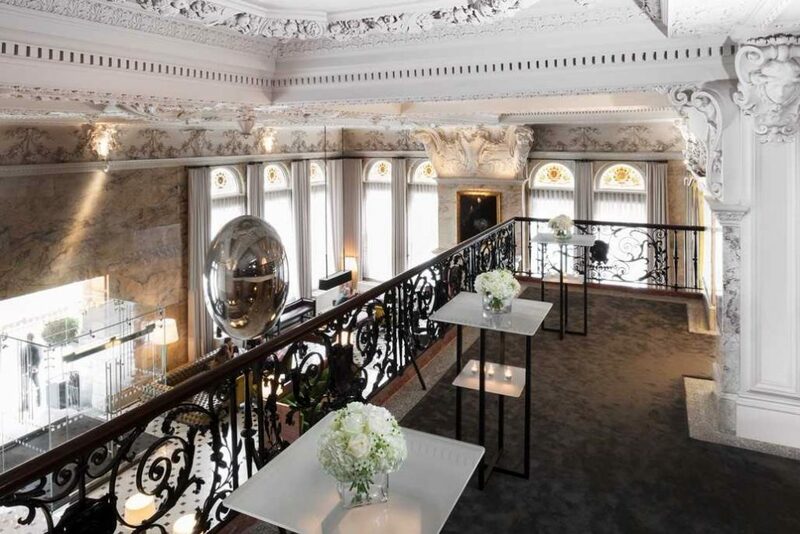 Part of the charm is its Georgian feel, showcasing tall Corinthian pillars, manicured terrace gardens and charming ornate porticos – making it a great choice for award ceremonies, banquets and business meetings. Hendon Hall offers a variety of options to choose from to help you host the perfect meeting. There are four exclusively arranged meeting rooms with different styles available. The elegantly furnished Johnson Room is ideal for private conferences and board meetings with dinner. It can host up to a maximum of 35 guests. 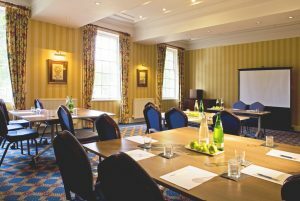 The bright and sunny Sheridan, with oval seating and large elegant bay windows overlooking the gardens can seat up to a maximum of 40 delegates. 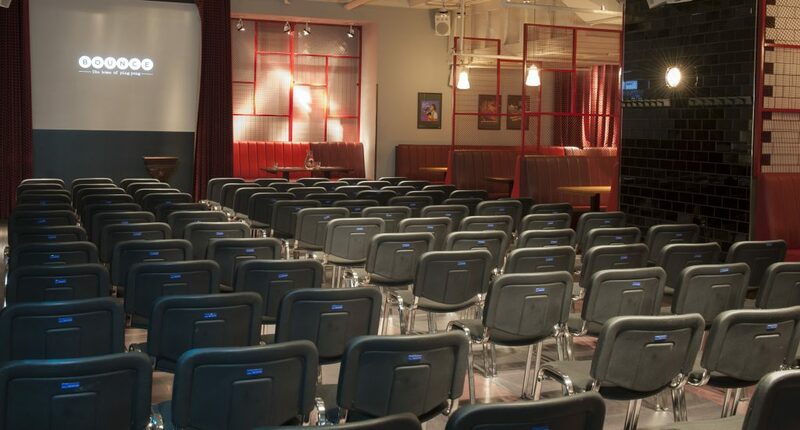 If you are looking for larger spaces, the Hogarth is ideal with elegant seminar style seating. This room has a maximum capacity of 50 guests. The hotel staff offer end to end assistance in planning, stage management and conducting events like award dinners, breakfast meetings with teleconferencing, production events and training conferences. The event management team can help you in putting together a plan of action and will advise on menus, cocktails and wine for drinks receptions. This elegant luxury boutique hotel is located in Berners Street, Fitzrovia, London. It’s a blend of curated design with unmatched hospitality and an excellent dining experience. Its décor is eclectic with the choicest of artefacts and paintings from around the world which will intrigue and amaze guests. The spacious lobby and flowing corridors transpose guests to a different era, making it an excellent venue to host business meetings, banquets, award ceremonies or even a pampering weekend getaway! The London Edition business centre is known for its bold styles and contemporary spaces. The hotel offers a variety of rooms to choose from. The elegant penthouse is tastefully decorated with cherry and maple wood and is an ideal room to shake hands and close a substantial deal for your business. This exquisite conference room is one of a kind. With a boardroom seating capacity of up to 28 delegates, it is the ideal place to book for your VIP guests. The Spiffy Studio U Shape room is great for hosting conferences. It has a maximum seating capacity of up to 20 guests. Its wall mounted plasma screen is the perfect equipment for your presentations and slideshows. For larger seating, the Studio 2 Boardroom is good. Crisp décor with classy retro furniture is a highlight of the room which has a seating capacity of up to 26 guests. When in The London Edition, make sure you have time to experience the atmosphere of the hotel. Don’t forget the Scandal Water, a new concept in tea served in the Punch Room, inspired by the 19th century tea drinking tradition among the upper echelons of the London society. Bounce, nestled on Old-Street, Shoreditch, London offers a new and unique social entertaining concept. Bounce is designed specifically with conference and group entertainments in mind, which makes it one of the best and most sought-after choices of East London. With ample car parking and valet service provided, hosting an event is never going to be a problem at Bounce. The hire venue offers affordable packages to suit every pocket without compromising on quality. Bounce’s unique flexible entertainment packages include hosting functions from 6 to 500 guests per occasion. It offers two main meeting rooms with several seating options. The Main Space, offers several settings with flexible seating options. The maximum seating capacity here is 50. 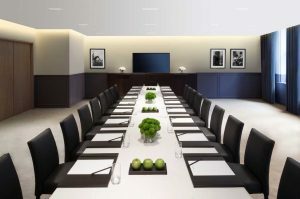 The Play-Room’s Boardroom can host a maximum of 28 guests. You can also hold your London meeting in a more private, elegantly decorated room within Bounce. Above all, the experts at the venue can tailor a flexible seating plan based on your requirements. So whether it’s a theatre style set-up or the classic Cabaret style, they will accommodate your needs and help you plan that perfect meeting. Another highly talked about unique feature of Bounce is its ping-pong culture. The luxurious Play Room which can host up to 120 guests, has state-of-the-art presentation systems and surround sound systems plus three butterfly ping-pong tables. How cool is that? With a cocktail bar and a dedicated bartender, it’s a meeting room no one would want to leave and completes our round-up of inspiring meeting rooms in London. Be it a glamorous evening of entertainment, an impressive business meeting or just a laid-back retreat, there is a great venue out there for you in London. Check out the five venues we’ve covered in this guide, and make sure your business meetings are all about your guests, their experience, great food, high end technology, and of course, your business’s branding. Previous Post:Findmeaconference Team share Christmas party planning tips! Shining a spotlight on the UK’s best meeting and conference venues. DFC House, Boston Road, Gosberton, Lincolnshire. PE11 4NR. All the latest venue news, delegate discounts and room hire rates straight to your inbox. Sign-up is safe and secure. We will not share or sell your details and you can unsubscribe at any time.